5G Playground | What is 5G Playground? The 5G Playground represents a comprehensive end-to-end testbed infrastructure, enabling the deployment of the use cases in a realistic environment as well as enabling the R&D community to understand the complexities of running a complete system. A network infrastructure connecting the radio components to the central data center as well as connecting the FOKUS a high speed optic fiber network. A large set of components managing the network infrastructure – including monitoring, device management as well as fault, configuration, accounting, performance and security management and means for semi-automatic OAM. 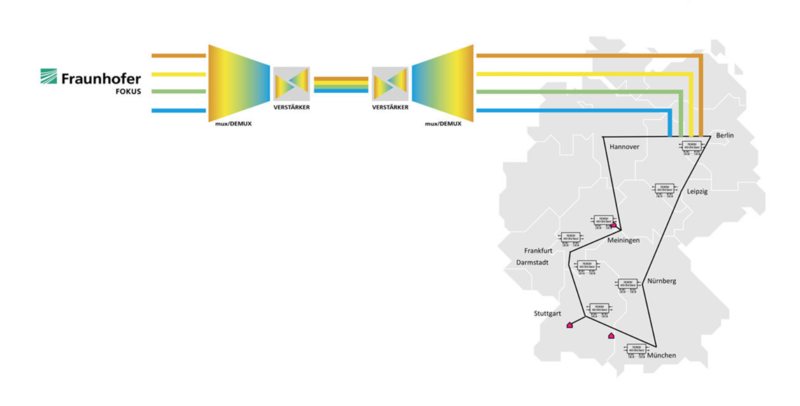 Spectrum allocation – Fraunhofer FOKUS has received test licenses from the local regulator as well as from all the German operators to enable with the required spectrum the testbed facility. Edge nodes – 5G playground uses SFF Atom-class nettop PCs with Ubuntu OS for the deployment and experimentation with edge components. For a larger edge node, workstations could be also used. 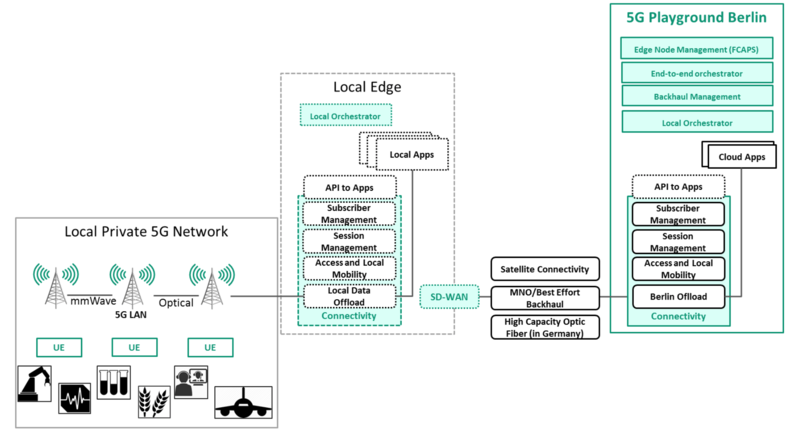 For connectivity to remote locations, the 5G Playground will be extended with satellite connectivity, through this freeing the testbed for any locally specific backhauling requirements. 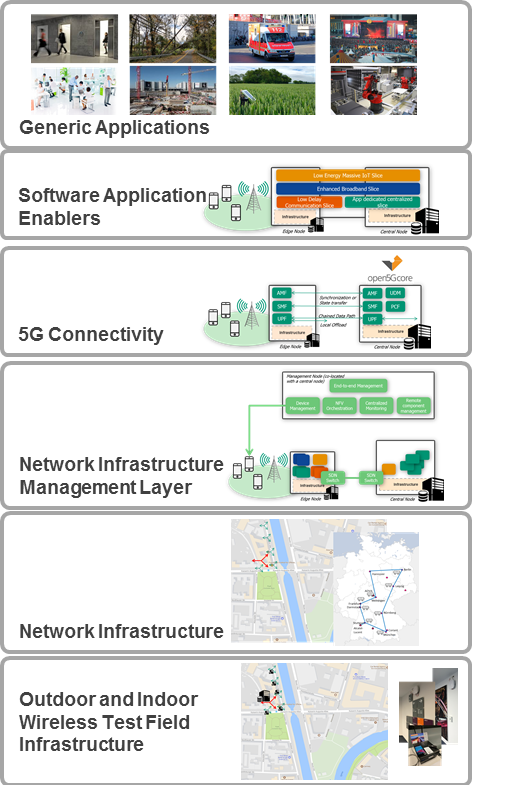 On top of the infrastructure, the 5G Playground includes a large number of software components, enabling the proper experimentation across the environment. End-to-end network management – the edge nodes are managed through a comprehensive system from the central entity including fault, configurations, performance and security management. For research and development purposes, the 5G Playground is directly connected to a Germany-wide fibre glass network. FOKUS employs state-of-the-art, high-end optical wavelength devision multiplexing and demultiplexing to realize backbone connectivity of several 100Gbps. The fibre-based connection allows to connect the playground existing, state-of-the-art access networks that are remotely deployed, as well as to prototype installations of upcoming 5G New Radio access technologies. Besides, the fire connection allows to tightly integrate with remote sites of research and development facilities of other partners and with remotely deployed backend storage and compute facilities. Remote locations, which may be integrated in the 5G Playground, include for example the Fraunhofer Heinrich Hertz Institute providing one means of new radio access technologies, and the Fraunhofer Institute for Production Systems and Design Technology providing a shop floor environment for experiments focusing on time-sensitive-networking (TSN).